Download a blank fillable Dd Form 1348-5 - Notice Of Availability/shipment - 1969 in PDF format just by clicking the "DOWNLOAD PDF" button. 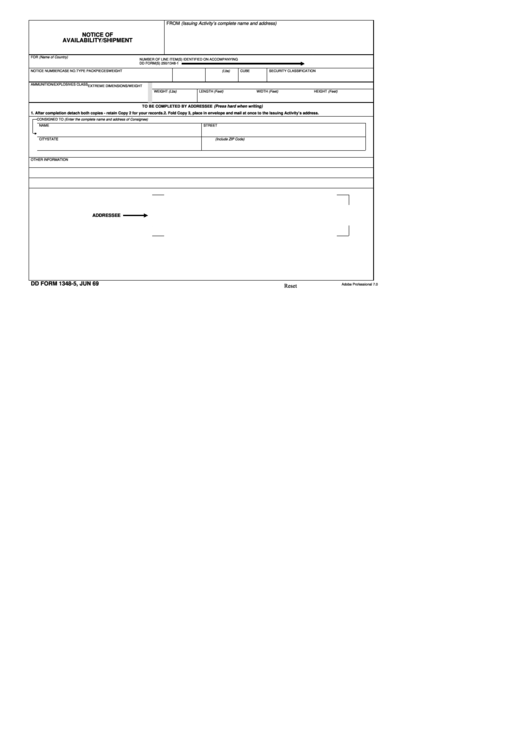 Complete Dd Form 1348-5 - Notice Of Availability/shipment - 1969 with your personal data - all interactive fields are highlighted in places where you should type, access drop-down lists or select multiple-choice options. 1. After completion detach both copies - retain Copy 2 for your records. 2. Fold Copy 3, place in envelope and mail at once to the Issuing Activity’s address.